How does a tuner… tune? 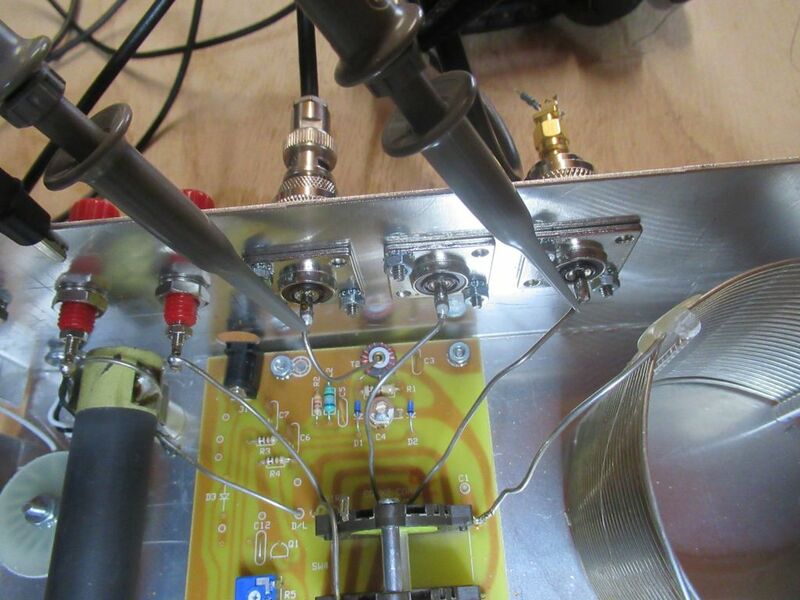 Most ham operators know that by combining inductors and capacitors in various configurations, they can tune their antenna impedance to match their transceiver. 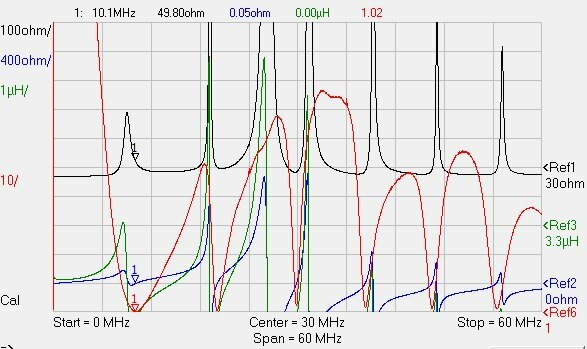 Many people, due to their experience, can also estimate the µH and pF ranges they need to tune on the various bands. But, what is the basic principle that actually allows a tuner to tune? And is it true that the power reflected by the mismatched load is dissipated by the tuner? We have that C=66.24pF and L=0.939µH. 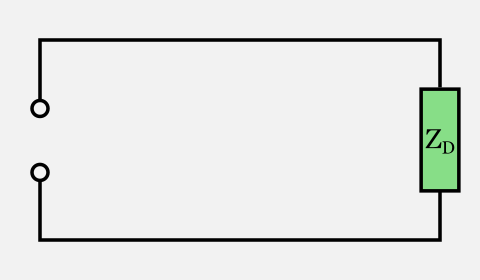 Why are these exact values able to tune our load? The principle that allows a tuner to “tune” is the same of the trick that every electronic technician, even beginners, use to “create” resistor values by combining other resistors in series or parallel. We have R1=100.048Ω and R2=327.47Ω. 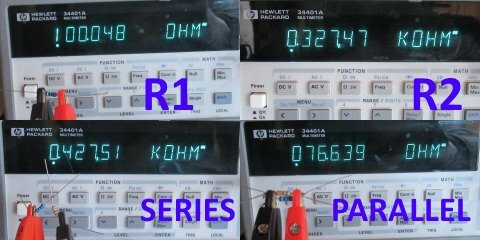 If we combine them in series, we have that  Rs=R1+R2=427.518Ω, confirmed by the measurement of 427.51Ω. If we combine them in parallel, we have that  Rp=1/((1/R1) + (1/R2))=76.635Ω that is also confirmed by the measurement (76.639Ω). The operation 1/x is called the reciprocal of x, so  can be expressed as the reciprocal of the sum of the reciprocal of each resistance. 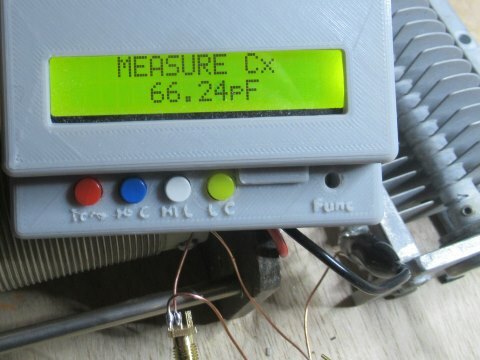 The resistance case seen above is just a special DC case of more general AC concept called impedance. The impedance describes a component in terms of resistance and reactance that show at a given frequency; if the frequency is 0Hz, we have back the “DC” case. When we measure an aerial with our antenna analyzer, we can read on the display the resistance (R) and the reactance (X) which form the impedance of that object at the measurement frequency. It is important to underline that the impedance is always formed by two numbers: R and X. When people use a single number for the impedance, there is always something implied: for example, when people talk of a “50Ω antenna”, they mean “a R=50Ω X=0Ω antenna” where “X=0Ω” is implied. 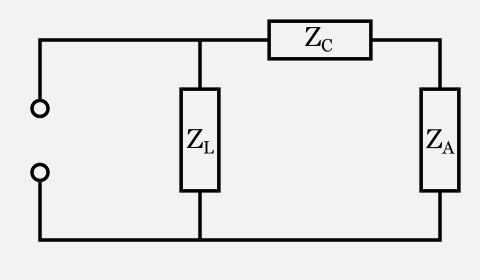 The impedance pair of vaules R,X describes an equivalent circuit made of an ideal resistor of resistance R in series with a capacitor (if X is negative) or an inductor (if X is positive). 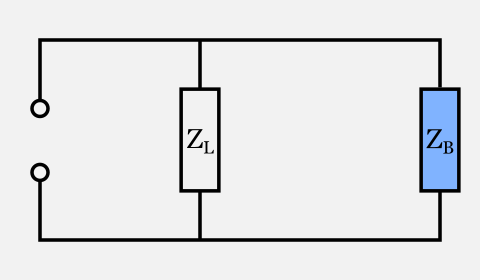 If X is zero, the impedance is equivalent to a simple resistor and it is defined resonant. How do we calculate the “X” reactance? Now, we shall calculate the impedance of the inductor and the capacitor of our tuner. Our tuned circuit now has three components: the load (i.e. the antenna or whatever we connected at the tuner output) plus the capacitor and the inductor of the tuner. We also know exactly the R,X impedance of each of them. If they were simple resistors, we would know how to replace them with a simple equivalent component (another resistor): by would simply add them. 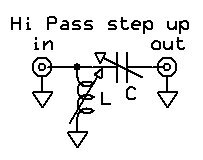 Now we have left two components in parallel: what is their combined impedance? The formula for parallel resistances  suggests that we should calculate the reciprocal of ZL and ZB, sum them together and then calculate the reciprocal of the resulting value. But how do we calculate the reciprocal of an impedance, which is formed by two values R and X? The final impedance of the entire circuit is R=49.2959Ω X=0.5053Ω is almost a perfect match for the target impedance of R=50Ω X=0Ω and very close to the measured value of R=49.8Ω, X=0.05Ω. 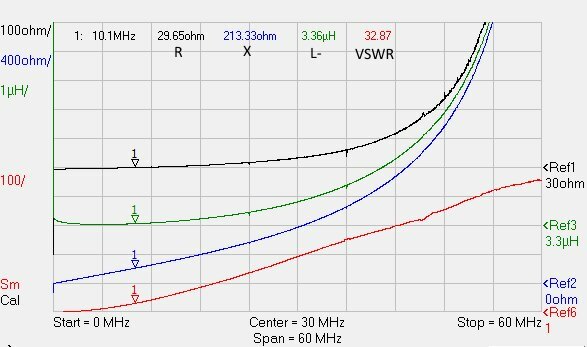 How much power is actually “lost” in the tuner? Power can only be dissipated by the resistive part of the impedance. If we could make a tuner with ideal capacitors and inductors (i.e. purely reactive), the power dissipated by the tuner would be none. The power actually dissipated by each component can be calculated with the same basic circuit rules that allows us to calculate the power dissipated by each resistor in a resistor network. However, usually the resistance of the tuner components is not high enough to cause significant losses in the tuner itself in most tuning cases. 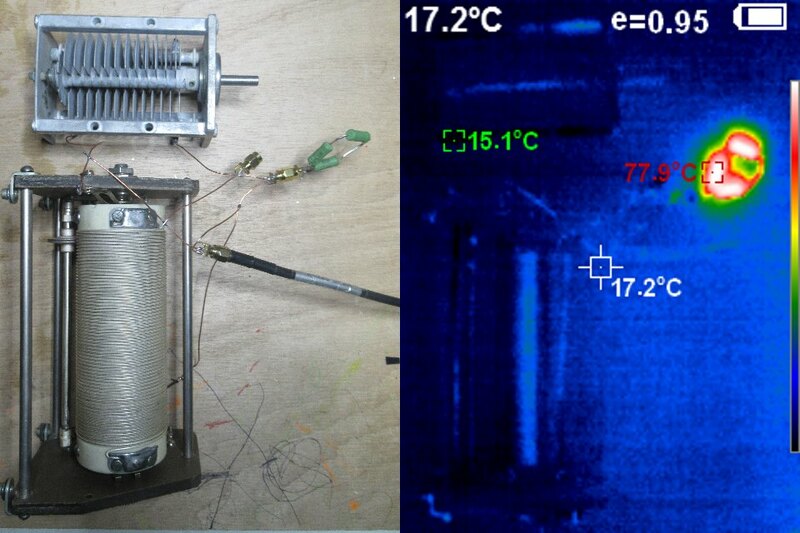 This fact is clearly shown by my tuner in action under a thermal camera: as we can see, only the load resistors are hot while the tuner components are not dissipating any relevant heat. 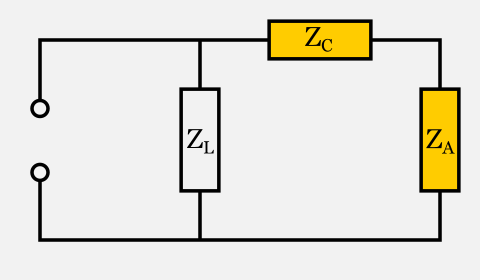 A tuner is able to transform the impedance of the load into the impedance required by the generator by creating a circuit that, combined in series/parallel with the load, adds up to the required impedance. Since the components added by the tuner are reactive, no power is dissipated by an ideal tuner and all power is trasferred to the load. Real tuners are designed to have very low loss components, so usually almost 100% of the power actually reaches the load. 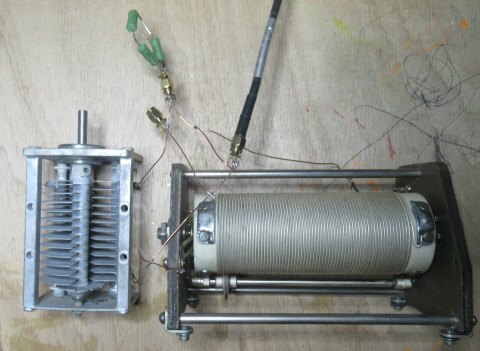 This is an article about how a tuner does the tuning process and it efficiency, not about what a load does of the energy it received. 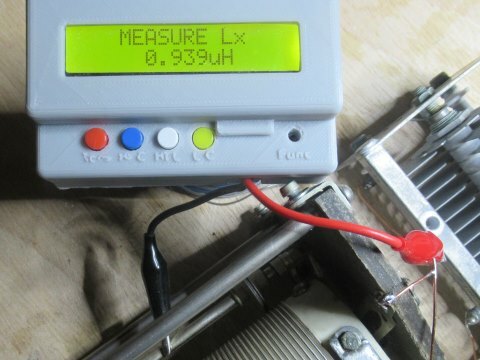 If you connect a transmission line between your tuner and a mismatched antenna, the trasmission line will dissipate more power than usual, sometimes a lot of power: in this case, blame the transmission line, not the tuner. To know more about transmission lines on mismatched loads, please refer to The myth of reflected power. Finalmente ho capito come funziona un accordatore. Prima mi sembrava qualcosa di magico, che in trasmissione non facesse passare la corrente riflessa verso l’rtx, mentre in ricezione ne coadiuvasse il transito. Cosa ovviamente impossibile. Quindi quello dhe prima mi appariva come una sorta di diodo nella sola trasmissione ora non ha più veli. Eppure ne ho cercata di documentazione per capirci qualcosa. Once again, grazie Davide. “Since the components added by the tuner are reactive, no power is dissipated by an ideal tuner and all power is trasferred to the load.” — That’s true if you consider the load to be the coax attached to the output of the tuner or if the tuner is located at the antenna input. But if the antenna is not a perfect match to the coax, power is dissipated by the coax. Yes, that’s true. However, this is an article on tuners, not transmission lines. Each component has its own role in transferring the energy and we can not blame the tuner for the energy dissipated by the transmission line. Good article, thanks. Antenna turners do work and will result in getting more power into the antenna/radiator. What the antenna does with this power is another issue. 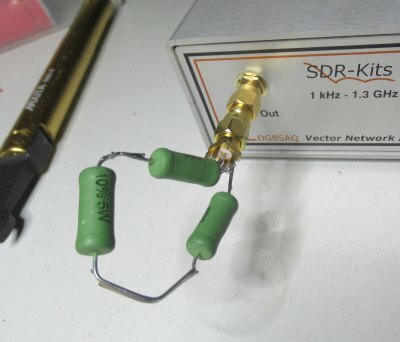 But the article addresses how to get the match between the radio and load/antenna system.